In Loving Memory of D. Dusty Devlins. . .
It’s now been a year since we lost Dusty Boy—the day after Christmas, 2008. For a dog I lovingly called, among many other things, “Knucklehead,” I figure it is time to record some of his shining moments—good and bad. I owe him that much. Dusty Boy, one lovable Buckethead. Dusty was an Elhew Pointer born in the summer of 2002. With his light orange-colored ears and eye patches and small freckles that dusted his white body, his name matched perfectly his appearance. I’ve often heard Dusty’s coloring described as “lemon,” which seems only fitting. In many ways, he was a lemon when it came to his obedience and bird hunting abilities. However, characteristic of his Elhew breeding, Dusty was very affectionate and loved to be praised and petted. Despite his shortcomings, Dusty was a super nice dog. You couldn’t help but like him for that. Before he was my dog, he belonged to my brother, Shawn. From an early age, Dusty was plagued with bum luck. When he was young, he got kicked in the head by a horse. I have to wonder if this trauma knocked a few screws loose as afterwards Dusty always wore a goofy grin and held his ears in such a way that made him look like a droopy beagle. For the rest of his life, he wore a nasty scar over his right eye. Later in his life he blew an ACL and had to get knee surgery. This put him out of commission for the 2005 hunting season. The following spring he blew out his other ACL. In the fall 2006, Dusty had a run-in with a porcupine and lost terribly. Afterwards, his mouth had so many quills protruding from it that he looked like he tried to eat a canister of white hot chocolate straws at the same time and they all got stuck. His chest looked like he had been attacked and shot by the darts of 1000 pigmy warriors. It took me two hours to pull all of the quills out one by one. With his poor luck, you couldn’t help but feel sorry for the guy, but more on that later. 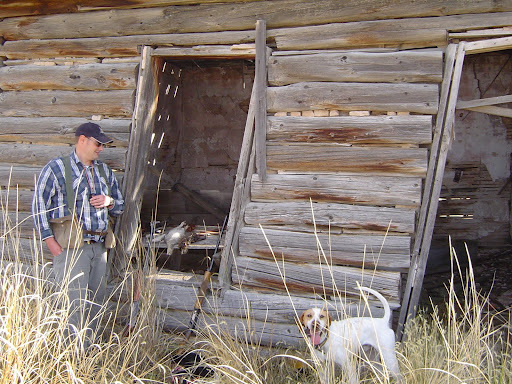 One of earliest memories of Dusty was from a sharptail hunt at a covert my brother, Shawn and I dubbed “The Royal MacNab.” At the time, Dusty was still Shawn’s dog. As we stepped into this special covert with the sun rising from the east, we heard a strange sound, which sounded like chickens clucking in a chicken coop. I have never heard anything like it before or since. The rolling CRP covered hills literally were alive with the sound of sharptails. My brothers and I felt this—hard to describe—thrill that we were in for a banner day. Apparently, Dusty felt it too. As we let the pack of dogs loose, one setter, two brittainies, and two pointers, Dusty promptly proceeded to run wild flushing dozens of sharptails to the horizon with the hunters watching helplessly from hundreds of yards away. I make it my rule to never criticize another man’s dog, but I definitely whispered some expletives regarding Dusty’s shenanigans under my breath. Let’s just say, I was not impressed and, from that point forward, he gained the nick-name, “Bustin’ Dusty.” When Shawn finally put Dusty in the kennel, we ended up having the red letter day we all dreamed of. 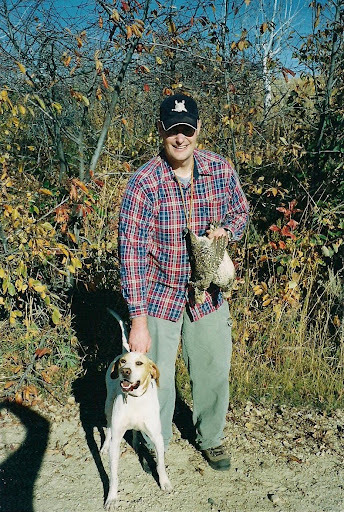 In the Spring of 2004, Shawn offered to give me Dusty assuring me that he had some redeeming qualities including hunting ability. 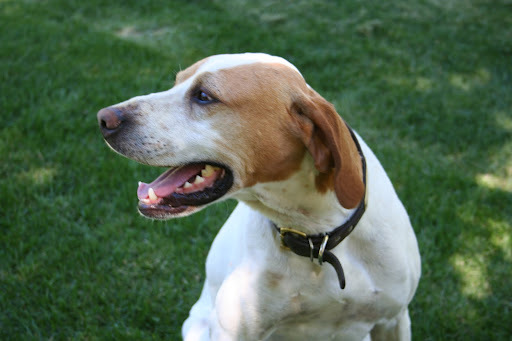 Desperate for another Elhew Pointer to fill the void left by Farley’s loss, I accepted with high hopes for Dusty and a plan to utilize a shock collar to curb his wayward tendencies as exhibited the year before. Opening weekend, I tried to use the E-collar, but unlike hardheaded Farley, Dusty did not take well to “electrical persuasion.” Instead, he just shut down and followed behind me the remainder of the hunt. Luckily for Dusty, my E-collar soon kicked the bucket. Just as well, as I didn’t have the heart to use it on the unlucky sucker anyway. After some more chit-chat, we parted ways and I hiked up the hill opposite of Grouse Rock. About fifteen minutes into the hike, Dusty stopped and gnawed at his paw (there’s that bad luck again!). I could see cactus spikes protruding from his tender pads and carefully removed them one by one. Up further on the bench, there were a few service berry and choke cherry bushes surrounded by sage and buck brush. Under one of the larger choke cherry bushes, Dusty locked up on point, but his tail flagged. Remembering the warden’s insulting comment, I doubted my dog. I also thought: I hope this isn’t a porcupine! Looking back, I believe I was subconsciously thinking this because I had just pulled cactus quills from Dusty’s paws. Dusty moved off point, but relocated and locked up solid. Something was definitely there and I knew I needed to honor the point. I walked toward where he was pointing and a big blue grouse flushed out the opposite side of the bush. Of course, I missed an easy shot. I should have trusted Dusty! Dusty is not the only member of the team who sometimes left something to be desired. A few weeks later, on the opening weekend of sharptail season, Dusty further showed his worth on the Royal MacNab. Again, the sharptails were present in abundance. In contrast to the fiasco a year before, Dusty worked with me in range. In fact, as we crested one of the bigger hills in the rolling CRP fields, Dusty cranked down on point and a sharptail flushed nearby flying right to left. I swung out well ahead of the grouse, squeezed the trigger, and dropped it like a stone. This was the very first bird that I took over one of Dusty’s points. First Sharptails with Dusty. Notice the goofy way Dusty held his ears. In November of that same year, we returned to Grouse Rock and again hunted the opposite side. We came into this birdy-looking saddle and Dusty struck a nice point in a berry bush, but this time his tail was not flagging. Remembering my lesson from earlier, I honored the point and a ruffed grouse got up in front of me. I whiffed my first chance, not once but twice, but marked the bird down. On the second flush, I missed again, swung hard, and caught the bird just before it tried to duck behind a huge pine tree. Despite my poor shooting, I count this as a bird taken from one of Dusty’s points. I named this covert, the “Blazing Saddle,” because of all the powder I burned trying to harvest a bird over Dusty. To be continued above. . . . Remote Shock Collars are one of the most effective, easiest and most humane training aids available. Remote Shock Collars are placed on a dog's neck, allowing a trainer to deliver small static corrections of varying strength by remote control. The correction the dog gets from the remote dog training collar is no different than static from walking on carpet. The benefits of working with a remote dog training collar is the trainer can immediately correct a dog's mistakes at a distance far greater than leash training allows. A Shock Collar is a safe, effective and humane way to train your dog. A Dog Training Collar is a safe, effective and humane way to train your dog.